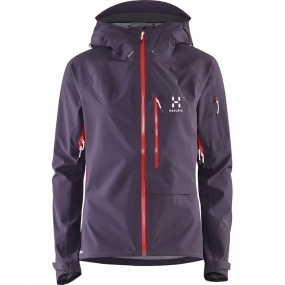 Designed with ski touring in mind, Hagl�fs' hooded Women's Touring Proof Jacket feels like a second skin. Its stretch laminate fabric offers excellent movement and superior protection from wind and water.Proof 3.5-layer, four-way stretch fabric is optimised for comfort while providing durable, waterproof and windproof protection. A three-way adustable hood with laminated, wire-supported peak protects your head and face when the clouds roll in, while underarm zips allow ventilation as your body temperature builds.